When a company is not able to pay its debts when they fall due, or its liabilities outweigh its assets, it can be placed into business liquidation, which involves selling the company’s assets for the benefit of repaying creditors. The process can be started on a voluntary basis by a company (directors and shareholders) or through a court order by another party. If you are considering business liquidation or have had a winding-up petition served against you, this article will provide details about what occurs during the process. The financial affairs, possible offences and value of assets will differ with each company. Therefore, no two liquidations will be alike. An application to the court can be made by one or more company shareholders or directors, or by a creditor. A resolution can be passed for voluntary liquidation by the company’s shareholders. Once it’s been decided that liquidation action will be taken, a liquidator must be nominated and then appointed. This individual is a licensed insolvency practitioner, and they are in charge of running the process of liquidation. Once appointed, the liquidator assumes complete control of your business. They will also be responsible for selling off your business’s assets for the benefit of the company’s creditors. Because they are in control, the liquidator will liaise with the relevant authorities, keeping them abreast of the process. Any expenses for liquidation will be paid by the liquidator. Following the appointment of a liquidator, any previous directors automatically relinquish control of the company and are no longer authorised to act on its behalf. However, their statutory director duties remain. Once a liquidator has been appointed, former directors must agree to complete transparency, which includes handing over all company information. Once a company has entered into liquidation, all business must stop immediately. No new employees will be taken on. Existing employees will be made redundant and their claims for arrears of wages, holiday pay, notice pay and redundancy pay will be dealt with by the redundancy payments office. For directors, liquidation doesn’t mean that your option to be a director elsewhere is revoked; you can become a director of another company after liquidation of the current company has been completed (Subject to there being no disqualification order made against you). Directors can also purchase the assets of the insolvent company for the purpose of using them in a new company. All debts (unless personally guaranteed) are left with the old company. Although liquidation can be a stressful and embarrassing process, it is not an uncommon one. 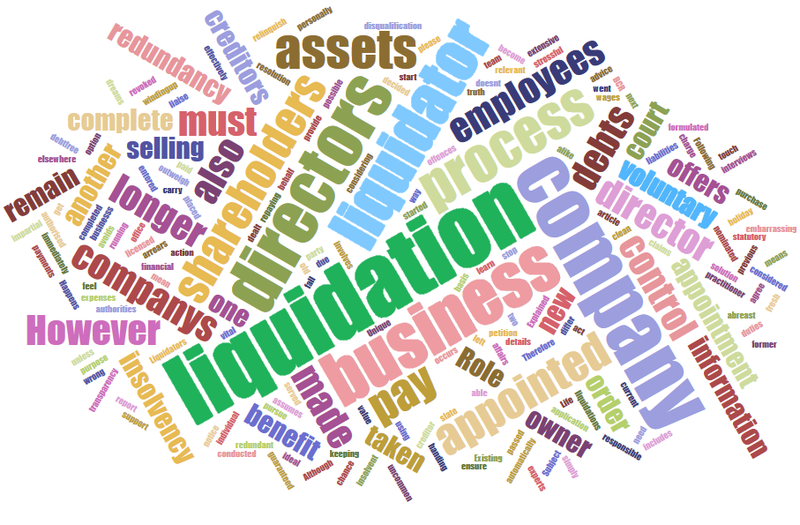 Liquidation is the ideal solution when a company simply can no longer carry its debts effectively. However, it should not be considered a way to remain debt-free. Some feel that liquidation means that they can no longer pursue their dreams of being a business owner. This could not be further from the truth. As a business owner, liquidation can offers you a clean slate, a fresh start. However, it also offers you the chance to learn. Because the appointed liquidator will have conducted extensive interviews with shareholders and directors and formulated a report about what went wrong with the business, you will have the vital information you need to ensure that your next business avoids liquidation. For impartial advice and support through the liquidation process, please get in touch with our team of insolvency experts at BCR.